So festivals are around the corner in India, you have bhaiya duj, dhanteras and the biggest festival of the year- Diwali when everyone wants to dress and look their best. I have decided my Diwali outfit from now itself and just decoding my makeup for the Diwali look. If you would like to see what products I have chosen for my Diwali look, let me know, I would do a post on that! So moving on to today’s post on Indian Festive Season Makeup Essentials, I’m listing down all you need to have in your makeup kit for the festive makeup look. Primer: Beginning with the makeup order, primer is what should go first on your skin after moisturizer. I know many of you don’t consider primer as a makeup essential but when we are talking about festivals meaning late night visits to relatives, friends, shopping, photo shoot with family and friends then you certainly will need a primer that would give you a smooth base and hide your pores plus will keep your makeup lasting long so you wouldn’t have to worry about touching your makeup again and again. Do invest in a primer for the festive season and coming Indian wedding season to make your makeup last long. Foundation: If you want a flawless clear skin, choose a medium to heavy coverage foundation without SPF since you would be mostly getting ready in the night time for celebrating festivals. And if you already have clear skin, go for sheer coverage foundation or the good old BB/CC Cream according to your skin type. Concealer: Yeah you need it if you have big scary dark circles and pigmentation areas. I don’t think my makeup is ever complete without a concealer be my foundation gives me flawless coverage, the reason is I have acne marks which doesn’t seem to hide with anything other than a good concealer. My current favorite is MAC prolongwear concealer after the MAC studio finish concealer. Pressed/Loose Powder: If your skin still gets oily, you may need a pressed powder to control excess shine and banish oiliness. But if you prefer dewy glowy look, you can skip pressed/loose powder and just move straight on to the blush. For those who want a matte look, pressed powder would do that for you!! Blush: Since festivals are all about shimmery glowy makeup, I would suggest you to go for blush with shimmers but if you don’t like shimmery effect and you have acne, go for a matte pretty pink blush. Pink blush would really complement the festive makeup look. Black Kohl: I think kajal goes really well with traditional Indian look. Go for dark kohled eyes or just line your waterline lightly with a black kohl if you don’t want to look too bold. Mascara: You need a mascara to complete your whole makeup look, use a curler first to curl your lashes and give them volume, then use a volumizing mascara, you can only use mascara if you don’t have a curler, simply invest in a high quality volumizing-lengthening mascara. Eye Liner: Go heavy on the liner this time and create some bold eye makeup looks with gel or liquid liner like the winged eye liner, cat eye liner or just extend the liner to the end of eyes. Bronze/Gold and Shimmery Eye shadow: Since it’s a festive makeup essential post, I have opted for shimmery eye shadows that goes perfectly with the Indian makeup look. You can create perfect eye makeup look with bronze or gold eye shadow. I think I would go with gold eye shadow look this Diwali with bold red lip color, this combination always rocks! Lipstick/Lip Gloss: It depends on you what you choose- lipstick or lip gloss. For me, it’s always lipstick. You can choose any shade you like for the festive makeup look but since Indian festivals are always loud and vibrant, I would say go for bold lip colors like MAC Flat Out Fabulous, MAC Ruby Woo, MAC Chatterbox and if you prefer light subtle shades then also there are lots of options. For budget lipsticks and lip gloss, check out the new Streetwear color rich lipstick/lip gloss range and Maybelline Coorshow Lipsticks. These are available in numerous shades so go and pick your shade. Hope you liked this post! Do share in the comments what lip color and eye makeup look you would be sporting this Diwali!! I am in love with Maybelline ColorShow Lipsticks!! This is uber helpful post Aroo. I totally loved it. 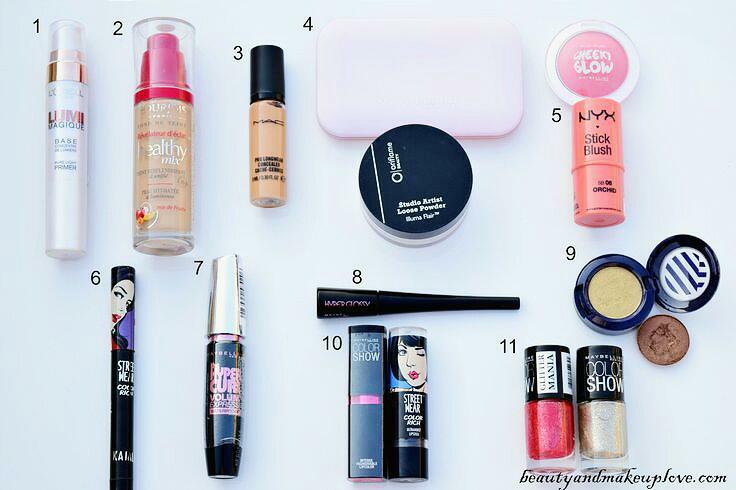 Definitely ..must haves :D Loved the post sweety..btw what primer is that ? Thanks Purva, that is Loreal Lumi Magique Pure Light Primer! I really need to invest in a good primer. Also, are these shots taken indoor ? Can you do a post on photography skills because I really liked the shots taken by you. You can try Revlon photoready primer, it’s really good!! Nope, the shot is taken in natural day light! I will def try to do a post on how I take photos for the blog!! Totally in consent with you Arzoo… infact these nail paints are perfect for Indian festivals ! Lovely compilation. Next Next post: Makeup Products I Finished Using!